How Far is MCB Meadows? 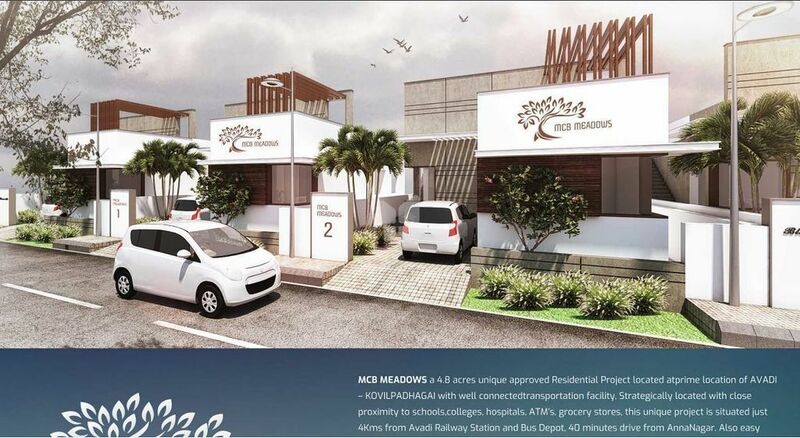 MCB Meadows, a residential project located in Avadi, developed by MCB Developers. This project is spread across 4.8 acres. This CMDA approved project offers different sized plots for sale in Avadi. This unique residential project is well connected by different modes of transportations. Thoughtfully designed with modern day facilities, so that the occupants can build home peacefully. Strategically located with close proximity to schools, colleges, hospitals, ATM’s, grocery stores, in addition to this MCB Meadows is located close to Avadi Railway Station, Bus Depot, many IT companies and industries like Heavy Vehicles factory, Engine Factory, Tube Products Of India & TI Cycles. Along with all these advantages and plots in Chennai, MCB Meadows offers useful amenities, some of them are street lights, well-laid roads, street lighting, avenue trees, blacktop road, jogging track, children's play area, rainwater harvesting system.